If you haven’t heard of StumbleUpon you are probably still a very productive person. If you want to make your time-wasting sessions slightly more efficient, you can use the keyboard to stumble instead of clicking the Stumble! button. I’ve calculated that you could save an entire 32 seconds per year this way, which is at least one more stumble (well worth it). It will also allow you to stumble without having the toolbar visible, so you have more screen space to stumble with. 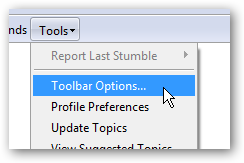 Just click on the Stumble toolbar’s Tools menu and choose Toolbar Options. 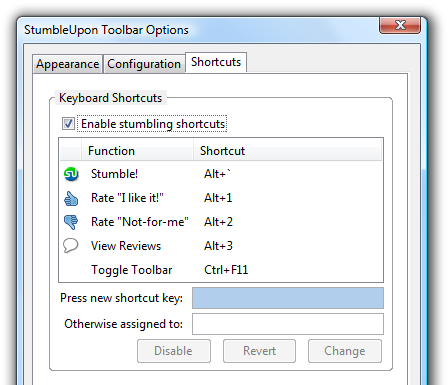 Select the Shortcuts tab and then check the box for “Enable stumbling shortcuts” to enable the hotkeys. 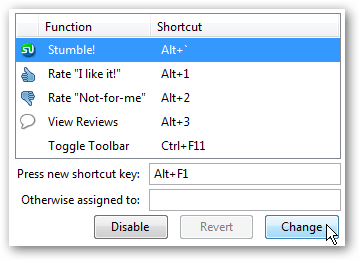 You can change the shortcut keys if you wanted to, just click in the new shortcut key box and press your new key. When you’ve chosen it, click the Change button. Disclaimer: Two hours were wasted in the research for this article. We are not responsible for lost time as a result of stumbling too often. I also tested this in Firefox.